NEW GLOBAL GUIDELINES have been announced to tackle the wealth of inconsistent and contradictory advice on the best care and maintenance of full dentures. The guidelines were developed by a global taskforce, which included representatives from the Oral Health Foundation and King’s College London, alongside leading experts from the Netherlands, Belgium, Switzerland and Japan. Following a comprehensive review and evaluation of the existing evidence and current guidance, the panel found a severe lack of clear or reliable recommendations for denture wearers. Daily cleaning of the dentures through mechanical action: brushing with a toothbrush or denture brush and an effective, non-abrasive denture cleanser (no dentifrice). Daily soaking in a denture-cleaning solution done outside of the mouth, which offers extra chemical breakdown of remaining plaque and some level of disinfection of the denture. All patients who wear removable dentures should not keep their dentures in their mouth overnight, unless there are specific reasons for doing so. All denture wearers should be enrolled into a regular recall and maintenance programme with their dental professional. The project received an educational grant from GSK and found recommendations to both dental professionals and denture wearers vary between countries and within a country. The report highlighted that advice usually relies on personal experience which has led to contradictory guidance from dental professionals and health bodies. Dr Nigel Carter OBE, CEO of the Oral Health Foundation and member of the Global Task Force for Care of Full Dentures, believes the new guidelines will be key in helping denture wearers significantly improve their oral health. Dr Carter says: “Our findings show that people with dentures are using a variety of ways to clean them. This ranges from soap and water to toothpastes, bleaches and commercial products. With the variety of recommendations available, this is not a surprise and had to be addressed. “The amount of inconsistent and often unproven advice about cleaning and maintaining dentures is frightening. Incorrect denture care can pose a real threat to both the oral health and general health of denture wearers. 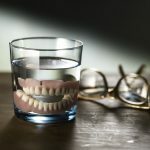 In 2046, it is estimated that there will be more than 18 million people over the age of 65 in the UK.2 The older you get, the more likely you are to lose some or all of your natural teeth and need dentures. The population of the UK is getting older and the number of people who need the correct advice on the best denture care will rise over the coming years. The full guidelines for optimal denture care can be downloaded on the Oral Health Foundation’s website (www.dentalhealth.org/denturecareguidelines). There is also an infographic available that can be printed out and handed to patients.